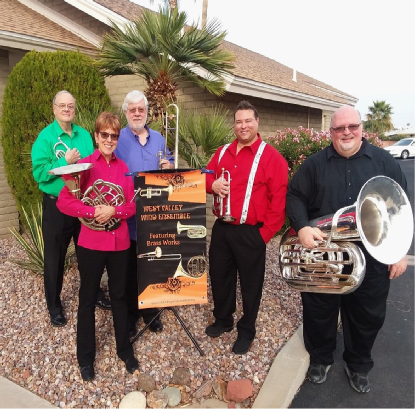 The West Valley BrassWorks (WVB) is a brass quintet from the West Valley Wind Ensemble Brass Section: Larry Barnes and Bob Appleton (Trumpets); Barbara Berg (French Horn); Larry Tallant (Trombone); Steve Massia (Tuba). Our quintet is composed of mostly retirees in the West Valley of the Greater Phoenix, AZ area who all share a passion for instrumental music that began in K-12 programs. The WVB has performed a wide variety of music including Baroque, Traditional jazz/Dixieland, Big Band, Movie Themes, Religious, Patriotic, and Holiday Music. As a brass quintet, we have the flexibility to perform in small venues as well as larger auditoriums and are available for weddings, dinner/reception music, church services/concert series, parties, and other special occasions. Steve Massia text/phone 480-332-9049, or Shirlee Lansing text/phone 651-402-5000.